"Infants, babies and toddlers can benefit from Cranial Osteopathy"
The rapidly developing baby's skull and skeletal system is softer than that of adults. The gentle approach that Cranial Osteopathy offers is often most suitable for treating infants, toddlers and beyond. Some adults also respond very well to cranial osteopathic treatment, and can be the treatment of choice in some circumstances. 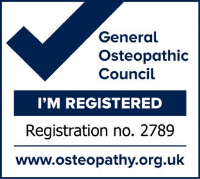 Cranial Osteopathy is a very gentle and safe form of Osteopathy. This softer and less invasive approach to treating the very young can also help to soothe and relax your baby/child.